Vintage Champagne 2010 Jose Michel Wonderful, fruity and round. Peaches and greengages with a lovely long finish. For the price it is as good as the 80 to 100 mark Vintage Champagne. If this is a special gift you can pick the delivery date after you checkout. 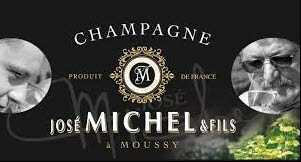 Michel's 2010 Brut Special Club is a bend of 50/50 Meunier and barrel fermented Chardonnay from 50-year-old vineyards. The 2010 was disgorged in January 2015 with dosage of seven grams per liter. It's clear and rich on the nose, offering dried fruits and sweet cherries, including the skins. Very delicate and pure on the palate, light and charmingly well balanced, this Cuvée has a well structured and persistent finish. I suppose the 2008 will gain complexity over the years and indeed there is enough substance for development. José Michel is well known for his Pinot Meunier, based in Moussy (Coteaux Sud d'Epernay), which covers 50% of his ten hectares of vines in the Marne valley. Indeed I like his straight and very delicate Pinot Meunier Brut, which is a lovely aperitif but should also ripen very well over a couple of years. The adventure started in the 19th century with Paul Michel (1860-1936) who was the first to harvest the grapes and bottle the wines in 1912. He was followed by Raymond Michel (1902-1971) who developed the manipulation techniques and extended the production of Champagne as well as the area under grape production. Lastly, José Michel, winegrower from 1955, a visionary uncompromising regarding quality, adapted each of the three grape varieties of the Champagne region to soil conditions and ideal exposure that can bring the best results. The family tradition is bound to continue, with three sons and five grandchildren. Wine making is one of the oldest arts that reflects not only the character of the terroir but also the talents of the wine grower. José Michel has understood this since a very long time. Proud of his traditional knowledge acquired over four generations, José Michel closely watches over each stage of the production, from pressing to disgorging, from dosing to shipping operations. A Christmas Champagne gifts for this Special Jose Michel Prestige cuvee blended with 50% Meunier and 50% Chardonnay, some of which is produced from vines of over 70 years old, is patiently aged across many years in the darkness of our cellars and reveals the superb alchemy between two contrasting and yet complementary grape varieties. Vinification : Stainless steel vats, with a blend of wine aged in oak casks. Dosage : 10 g/l Bottling : 0.75 litres - 1.5 litres - Old style bottle, very sought after presentation. Alcohol content : 12 % volume Colour : Golden yellow, delicate and lively bubbles. Nose : Elegant aromatic complexity with superb finesse, floral hints (rose) with hazelnut and grilled almond aromas. Mouth : Superb, full rich volume, generous and unctuous, with undertones of toasted bread aroma, stewed yellow-fleshed fruit with a slight floral touch. Food & Wine : This Special Club accompanies all of your haute cuisine meals (Foie gras, Saint Jacques scallops, Fatted chicken with cream, Beef filet, Grilled lobster).